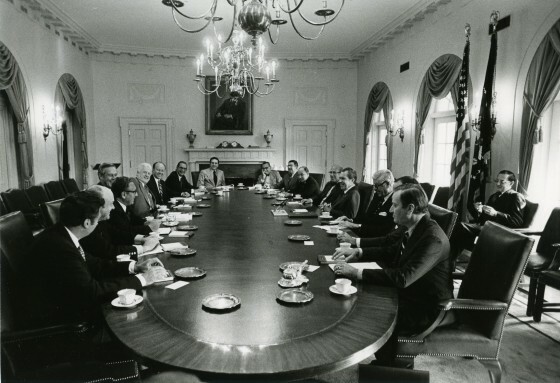 President Nixon holds a meeting in the White House Cabinet Room with several senior advisors to discuss energy on September 8, 1973. Attendees at the meeting included John A. Love, Roy Ash, Charles DiBona, Bryce Harlow, Deane Hinton, Henry Kissinger, Melvin Laird, Rogers Morton, and William Simon. On September 8, 1973, President Nixon met with major administration officials having responsibilities in the field of energy. The purpose of this meeting was to ascertain current and proposed programs initiated under and before former Governor of Colorado John A. Love assumed the role of Director of the Office of Energy Policy. In a two hour meeting, the participants briefed the President on energy/fuel shortage projections for the immediate months to come. Mr. Love in particular emphasized the urgency of Congressional action at this time. As is reflected in his talking points memo, Love stated that congressional action would not solve the immediate problem, but their inaction could make the national energy situation worse. He made light of the number of Nixon administration legislative proposals on the table–initiatives that would greatly assist in the nation’s energy recovery in the next 2-3 years. -The Office of Energy Policy would announce forecasts of the winter shortage in order to communicate more clearly the urgency of the short-term situation. -The EOP would meet with selected Governors to discuss what they can do to ease their states’ energy crunch during the winter. -The Oil Policy Committee would devise contingency plans. -The Crude Oil Logistics Committee would allow pass-through of increased prices of foreign crude oil and petroleum products. -John A. Love would take energy related trips to foreign countries. -The implementation of an energy conservations campaign involving industry, the public, and government. -The establishment of a proposed mandatory petroleum allocation program, prohibitions against fuel switching, and mandatory propane allocation. We have heard a lot about a crisis. I do not use that term, because we do not face a crisis in that sense of the word. I would simply say that in the short term we face a problem, a problem with regard to energy–heating, for example, this winter, just as we though we faced a problem of gasoline this summer, and the possibility of brownouts. We are not Pollyannaish about solving the problem, but insofar as the short-term problem is concerned, Governor Love has a program which he is working on and one which is designed to meet the problem and to deal with it. President Nixon agreed with Governor Love’s in-meeting push for Congressional action, shortly after at the press conference making reference to pieces of legislation pending Congressional approval. In my press conference a couple of days ago, I mentioned seven pieces of legislation. Today we have moved down to four pieces of legislation that we consider to be of the highest urgency and that must be acted upon before the end of the year. These pieces of legislation deal with both the short-term problem and address themselves particularly, however, to the long-term problem. Here, President Nixon refers to the Alaska pipeline project, the expansion of deepwater ports to authorize the ownership, construction and operation of marine terminals in federal waters on the Outer Continental Shelf, the deregulation of gas, and legislation with regard to strip mining. The president then highlighted his administration’s efforts that did not require legislation: relaxation of emission standards, the Elk Hills Naval Reserve development project, and the development of peaceful uses of nuclear energy. Because the United States, as a great industrial nation, the most advanced industrial nation in the world, must be in a position and must develop the capacity so that no other nation in the world might, for some reason or another, take an unfriendly attitude toward the United States, has us, frankly, in a position where they can cut off our oil or, basically more importantly, cut off our energy.